GenScript proposes a range of different purity levels to help you choose the right peptide purity for your peptide-based assays and applications. The list below displays the suggested peptide purity level that should be requested for various peptide applications. 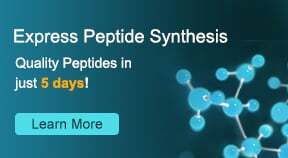 All purity levels are available via our Custom Peptide Synthesis Services. Peptides with purity greater than 70% are used for generating or testing antibodies. Peptides with an 85% purity level or greater are usually used in enzyme assays or biological activity studies. Peptides with purity greater than 95% are excellent for quantitative analysis. GenScript can also provide peptides with purity greater than 98% in large quantities, for use in commercial applications by industrial customers. At GenScript, peptide quality is verified by both HPLC and mass spectrometry analyses. QC data is included in the peptide delivery. Typical custom peptide synthesis delivery consists of lyophilized peptide of the required sequence, purity, and quantity, plus the associated QC reports. Every step of peptide synthesis is subject to GenScript's stringent quality control. For quotations, please use our Secure Instant Online Quotation/Order system. However, you may also contact us by email, phone (1-732-885-9188), fax (1-732-210-0262), or via our Secure Messaging System. Please use our online ordering system and either a PO (Purchase Order) or credit card to receive GenScript's fastest service. For batch order, please download and complete Standard Peptide Batch Order Form and email it to peptide@genscript.com. Our customer service representatives are available 24 hours, Monday through Friday, to assist you.